I'm currently on my 3rd cup of coffee, but it's the first one that tastes decent. I was drinking a French Roast blend from Daily Chef but I just wasn't enjoying it so I switched to their Colombian blend and it's just what I needed. I tried the Daily Chef brand a few months ago to see if it was an acceptable flavor as it was a much more affordable option for the 54 count boxes over my regular Starbucks or Caribou. The flavor of the Colombian is good, but if you read reviews about the product you'll see there was possibly a design flaw in the cup. (Reviews for Daily Chef K-Cups) . I also had issues with some of the cups from the first box I bought. However I've bought 3 boxes since then (2 Colombian and 1 French Roast) and I've not encountered any coffee grounds in my cup since that first box so it may have been a fluke in their machinery or the cups they were using at the time. My coffee drinking friends might want to look into this affordable brand - (available online or at Sam's Club) and see what you think. I am pretty happy with supplementing this coffee with a few of the other brands I use as well and haven't had any grounds issues. With a savings of about $15 over a case of k-cups of other brands, it's certainly worth mentioning. This morning over coffee, I was thinking about what to chat about and my thoughts went to pet feeders. The automatic pet feeders that are battery (or electric) run that dish out portions over a few days so you can leave for a weekend. We own an automatic pet dish I bought online I believe, around, December of 2003; and I wondered if it was still available and being sold. This is the actual style and brand we bought about 8 years ago. It's the Lentek Automatic Pet Dish. Here is the description they give - and I'll add my thoughts after. Although it says 6 days, that is only accurate if your pet eats just once a day. What it has is six slots for food. If your pet eats twice a day, it will be a 3 day feeder. It has ice packs you can freeze and insert in the bottom to help cool the food for a couple hours, but our cats won't touch wet or canned food so that is an option we never used. The first thing to point out is this really only works for cats or very, very small dogs. Even a large, intelligent cat will probably be able to break into it at first and because it is so light weight, most dogs will be able to get into it and eat all the food at once. I would only use it for cats or tiny toy sized dogs. I'll touch more on the topic of being easy to break into in a moment. The timer can be set for 6, 12 or 24 hours. At that point it will hum and the top will rotate to the next full opening, allowing your pet to eat that portion. The hum of the motor may startle them at first. In order to get our cats ready for us to go away for the weekend and be accustomed to it, I used it as their pet dish for the first week. By the 2nd day the cats had grown used to the hum of the motor, weren't scared of it and actually knew that the humming noise meant it was time to eat - and they would come running! By the time we used it for the weekend it worked perfect. As I mentioned above, your cat or small dog may try to get into it and pull it apart. In general, for an average cat or small dog, it will be fine. The human trick is to make sure it's put together exactly right. There is a small slot on the inside timer and it's very easy to not completely click it firmly into place. It seems like it is, but it isn't. If you don't press firmly and make sure it is locked down tight, your cat will be able to spin the top around or push the pieces apart. By making sure to line up the slot and press firmly, this makes it more secure. The second tip for your pet not breaking into it is by getting them used to it as I mentioned above, they are no longer interested in it. They ignore it until they hear the hum, come running to eat, and then go on their way again until they hear the hum. Our cats get to the point of knowing when it's going to go off again and will run and sit and watch and wait for it to hum and spin to the next opening for their next meal. Kind of neat how they instinctively know 12 hours have passed! (We set ours on 12 - to eat at 6:am and 6:pm). We have used this about 3 times a year for the past 8 years and generally found it to be great for our needs. When we leave for a week at a time I have a pet sitter come to the house every 3 days to refill the feeder and clean the litter box. This has worked out great! Just be sure to have your pet sitter practice putting together the pet feeder a couple times in front of you to be sure they firmly press that center timer! In general I give this a thumbs up. This morning I did find a few other versions available (that weren't on the market 8 or 9 years ago when we originally bought ours) and I may look into them in the future, but for an average price of about $30-$35, the one we have is an affordable option that I'm happy with and our cats are comfortable with. Christmas is over, the end of the year is fast approaching and the new year is right around the corner. This is where my thoughts are this morning as I sit with my coffee and think about what to discuss on Coffee Talking. I decided it was only natural that coffee talk would turn to fitness, as the new year is the perfect time to start a new you. Or me. Or us. I decided to focus on the only fitness regiment I personally know works; because it's the one my husband uses. Mr. Coffee (that would be my husband) has used the Insanity program off and on for the last few years and always (always!) see's results. He gets busy with day to day life and an odd work schedule - and after a couple months, realizes his back is sore, he's put on a few pounds and he isn't feeling as good as he knows he could. That is when he brings out his DVD's, kicks it into high gear and for the next 45 days or so, tries to adhere to a strict "no cheating" work out schedule - but he gives himself Saturday's 'off' - which keeps him on task. It works. He drops pounds, his back stops hurting, he is heart healthy and he has more energy. I wish I could say I join him in this Insanity packed evening workout, but I don't. I should. But I am about as anti-athletic and anti-exercise as you can get. True story. So, my chit-chat over coffee this morning about this particular program comes from my experience watching it work not only for my husband, but also for our oldest daughter (college age) who has also used it to get in shape when she finds those extra pounds have snuck up on her. INSANITY Deluxe program is the best of its kind. No other workout can get you these types of results in just 60 days. Guaranteed! Shaun's MAX Interval Training techniques are a step ahead of every other fitness program ever designed. You get you a lean, muscular body in a short time. 1: Dig Deeper & Fit Test: Shaun will put your body to the test and see what you're made of. 2: Plyometric Cardio Circuit: Burn fat with intervals of intense lower-body plyo and sweat-inducing cardio. 3: Cardio Power & Resistance: Build lean muscle and upper-body definition with strength-training and power moves. 4: Cardio Recovery & Max Recovery: Shaun goes easier on you once a week so you're ready for the next round. 5: Pure Cardio & Abs: This nonstop cardio workout is all extreme. 6: Cardio Abs: Do explosive intervals of cardio and core moves for rock-hard abs. 7: Core Cardio & Balance: Take a break after month 1 and gear up for month 2. 8: Max Interval Circuit: The interval circuit that's more intense than anything you've ever done. 9: Max Interval Plyo: Push your legs 'til they beg for mercy with power and plyo, all at your MAX. 10: Max Cardio Conditioning & Abs: Get pushed to your limit with this extreme workout. In the Deluxe program, Shaun takes INSANITY® to the sports world-boxing, football, basketball, gymnastics, track and field! In the MAX Interval Sports Training workout, Shaun mixes sports drills for the most INSANE hour-long workout yet. With the Insane Abs workout, you're going to find muscles you didn't even know you had! It takes the six-pack to the next level. Go one on one with Shaun in his Upper Body Weight Training workout. You'll work your entire upper body-chest, back, arms, and shoulders-to get even more amazing results. With the Deluxe program, you get a thick, professional-grade jump mat to help you get the most out of your workouts. Plus get a FREE body fat tester to measure your progress! This morning I happen to be sipping Starbucks Holiday Blend coffee, which made me think of Starbucks in general and I remembered they came out with a new coffee brewer of their own this Fall to rival the Keurig. I admittedly haven't paid a lot of attention to the new Verismo brewer for two reasons. The first being, I already own a Keurig and second, because of that, I'm not really in the market for a new brewer right now. But I'm interested none-the-less. Currently there are two versions available. The more compact, every day use Starbucks Verismo 580 and the larger, coffee shop like Verismo V-585 . The selling point is to brew your favorite Starbucks drinks at home and to rival the Green Mountain company who currently has the lead in this style market. However, you have to ask yourself if you will truly make the espresso and latte's at home, put them into your travel mug and take them with you even if you do invest in the machine; or if the stop in the drive-thru of Starbucks is more your style and you will probably go back to your old habit a week after investing in the brewer. This is important, because these are not cheap machines. The basic model sells for anywhere between $199 - $249 right now and the larger model for about $399. A pricy investment if you grow tired of it in a week or two and it's pushed to the back of the counter to gather dust. However, if you truly love your Starbucks coffee drinks, you want to entertain at home, enjoy your drinks at home or ultimately save money by not making a daily Starbucks run; the machine might be for you. One last thing; these new brewers take their own pods. The Verismo Espresso Roast Pods are completely different from k-cups and are not interchangeable. If you are purchasing this as a gift for someone this Christmas or even for yourself, you might want to invest in an extra box of pods. I was lucky enough through my position as a BzzAgent, to get to try the new Wellness Collection blend from Green Mountain. Previously I posted a review on the Focus Blend - which I found ok when drank piping hot, and I liked the energy kick it gave me; however I couldn't say I would choose to drink it over my regular blends just for the taste. I would however, choose it for the kick when I needed to be focused and get things accomplished. Last week and again today, I've been enjoying the Antioxidant blend. I admit I thought they would probably taste exactly the same; but in the end I've noticed they seem to be completely different. No heart racing, no energy kick; just a light, smooth coffee. Not the same at all. Brew your k-cup on the 8 ounce setting as directed. This gives you their recommended level of vitamins C and E in your cup and is brewed not too watered down to ensure you have good flavor. I don't have a scientific way of measuring the effectiveness of the vitamins added to the brew, not over short term anyway; but I can say I would be comfortable drinking this in the morning knowing it was giving me what a vitamin C and vitamin E vitamin would. This way I get a healthy dose of goodness and benefits with each cup that I would be drinking anyway! Bottom Line: Thumbs up on the Antioxidant blend for better flavor, but thumbs up to the Focus blend for the ability to see results instantaneously. I was given a free sample of the Green Mountain Wellness Blend for Keurig Brewers to try since I'm a BzzAgent. All thoughts and opinions are my own. I love my Keurig brewer and k-cups but they can be pricey so I purchase them in various places where I can get the most for my money without sacrificing flavor. One of the places I purchase k-cups is Sam's Club. (I also shop Costco but we recently relocated and I have a Sam's Club close to me while I have to travel further to get to a Costco). During one of my trips I picked up my regular Starbucks Pike Place Roast but for almost half the cost, I saw Sam's offered their own Daily Chef brand. 54 cups at $22 (ish) was a great deal, if they tasted good. My first (and only) issue with the Daily Chef brand isn't with the coffee itself, but the pod. My first brew had coffee grounds around the top of the liquid, sticking to the mug and a layer in the bottom of the mug. My second attempt also had grounds. Grounds in your coffee, no matter how good the coffee, is a deal breaker. Looking up some other comments about this coffee online, I found the same complaint; the pods are defective in many cases. Now, I've never had one 'blow up' in my machine, but I did read others that said they had that issue. As a matter of fact, after the first 2 pods that left grounds in the coffee, I got lucky and over the past 2 weeks of using them (along with others) I've not had a shoddy pod. They have all brewed as they should - no grounds. The boxes may have a mixture of many different batches, and they may get a poorly sealed batch mixed in. Now for the important part; the flavor. Excellent. Surprising, from an affordable coffee... but true! You have a choice between Colombian Supremo or French Roast. We currently have the Colombian and we really enjoy it. So much so, that with a mixture of original blend Caribou Coffee and the Daily Chef, my husband and I both reach for the Daily Chef blend over the Caribou. Bottom line? Daily Chef K-Cups for Keurig Brewers is a good tasting, dark roast coffee that we choose of some of the bigger brand names. Affordable and enjoyable. I not only give it a thumbs up, but I intend to make it a regular purchase in our home along with a few other brands! Over the past week I've been trying a new product by Green Mountain Coffee (thanks to my status as a BzzAgent, where I get products to review and share). In order to give a fair review I wanted to try them over a number of different mornings and in a variety of ways. I first brewed them and drank them as I normally enjoy my morning coffee; black. Over the course of the week I also added flavors and steamed milk and brewed at a stronger brew setting. Green Mountain Coffee® Focus Blend is a balanced coffee with 50 mg of L-Theanine to every 8 oz. serving. The Green Mountain Coffee® Antioxidant Blend has vitamins C and E added and also is recommended at the 8 oz. serving size. Both are made with a blend of lighter roasts and darker roasts to accomplish a mellow, medium roast finish. This medium blend is a happy middle ground I suppose for those like my parents, who enjoy light roasts and myself and my friends and siblings who enjoy a dark roast. Brewing a fresh cup of coffee at the touch of a button in my Keurig is awesome, but for those wanting to get additional benefits of vitamins or a focus-kick of L-Theanine might want to look into this brew. I personally don't take daily vitamins as I tend to eat very healthy and love my vegetables far more than I do sweets, so I was very interested in the focus blend, although I obviously tested both. The 8 oz. setting is the recommended setting. I found that brewing at the 10 oz. was too watered down and a slightly metallic or 'different' taste, -perhaps from the added vitamins-, came through. I also found the best flavor was to drink it piping hot. When the coffee had cooled after 5 or 10 minutes, the flavor changed and I found I didn't enjoy it as much and ended up pouring the last few swallows out. 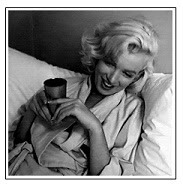 Granted, I'm a 'piping hot, strong and black' kind of girl, so there are few coffees I will drink once they have cooled. The antioxident blend is hard to gauge but I can say I noticed a difference with the focus blend. I actually would compare it to having an extra 'kick' of caffeine. I could feel my heart beating faster and had a burst of energy as if I was on my 3rd cup of coffee for the morning. Whether this is the L-Theanine or the amount of caffeine in the brew, I do not know, but I can honestly say I felt a kick in my energy level and therefore, my focus on the work I was doing. My final thoughts are that if I was simply enjoying a morning cup of coffee, I probably wouldn't choose this blend just for the flavor alone. However, if I was looking for an energy boosting and brain boosting blend, I would definitely consider this my 'go to' brand. Green Mountain Coffee has been a leader in the coffee industry for over 30 years and is recognized for not only their award winning coffees, but their brewing technology and social responsibility. For those who believe in supporting coffee coffees with a conscience, you might be interested in that. Now, on to my thoughts about the product! UPDATE FOR 2017: This was originally posted in 2012. Today it's getting hard to find these but occasionally you see sellers on Amazon with them to sell either new or used but I will update a couple similar items at the bottom of this post since I don't believe this product is being made any longer. I'm kind of excited about this coffee-themed product. It's right before Christmas and would make a coffee-drink kind of person very, very happy this holiday season. I've just spent some time familiarizing myself with the Mr. Coffee Frappe Maker . It's an all-in-one appliance that allows you to create frosty frappes at home. A cross between a coffee machine and a blender, this easy-to-use frappe maker brews and blends delicious chilled concoctions all at the touch of a button. Along with freshly brewed coffee and ice, you can add in any favorite extras, including milk, whipped cream, ice cream, chocolate-milk powder, and more. The unit's "pulse" blending button offers ultimate control over the consistency, while its sleek jar supplies a generous handle for easy serving. To top it off, garnish the beverage with whipped cream, nutmeg, cinnamon, or chocolate shavings, and enjoy. Whether for yourself or to entertain guests, you can now make a delicious frappe from home. Even better, the unit's small footprint takes up minimal space on the counter for easy, everyday access. How long will coffee keep fresh? How do I store it? Although I am prepared for power outages, flooded roads and other disasters that may cut off my power, water or access to stores for a good amount of time, the one thing I haven't really stored is coffee. This could be a disaster for me, as I have become one of those people who need their morning coffee routine to start my day! Without it I'm 'off' from my schedule and if I don't have my quiet, coffee time to myself, (the hot mug, the aroma, the silence of an early morning and finally, the sipping of my java) I'm a bear the rest of the day. The reason I haven't stored coffee (yet) is because I've been researching the best version to store and how to store, as well as how long it stores. The information basic is that green coffee stores for about 2 years, but you have to roast it and degas it before you can brew it. This morning we had a power surge and the power briefly went out, right in the middle of me brewing a cup of coffee with a k-cup in my Keurig brewer. This was the wake up call I needed. So without further adieu, I've decided this week is a week to purchase some sort of coffee for long term storage. And this information is the best I've found so far as far as being clear and concise. 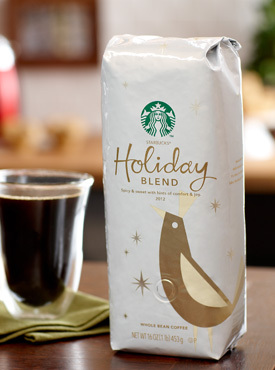 It's that time of year for coffee: Starbuck's Holiday Blend is Available! This morning I'm reviewing the seasonal Holiday Blend from Starbucks. Even though the calendar hasn't yet even arrived at Thanksgiving, my foray out-and-about yesterday to run errands was filled with holiday joy and Santa's galore. One of my errands was to pick up some coffee and even though we own and use a Keurig, I feel guilt spending so much on k-cups when I am easily a 3 or 4 cups per morning kind of girl. So, I regularly keep whole bean coffee on hand to make a small pot of coffee each morning as well as a back up. And with that long introduction, I give you today's coffee post; the Holiday Blend. Now, even though Starbucks has been releasing this blend since 1985, I have never bought it. Granted, I wasn't drinking coffee in 1985 (I was just barely a teenager then), but I've never felt compelled to purchase it. Yesterday however, I did. The gold and white is pretty and eye-catching and the description on the packaging said it was sweet and had a hint of spice. Try as I may to squeeze the package in the store and smell through the little air vent, I could not sense even a hint of spice or anything but regular coffee. Still, I was at the store FOR coffee so I thought I'd give it a go. It did not come in whole bean style though, only ground. The secret to this blend is the rare, aged Sumatran beans, which add a depth and mellowness to fine Latin American and Asia/Pacific coffees. I am going to describe it as a nice Sumatran coffee that isn't as bold as most Sumatran styles, and the mellowness comes through a little more than on the dark Sumantran versions, however I did not detect even a hint of anything 'spice' or 'holiday' in the least. Herbal, yes. Spice? Not so much. For those looking for a spice or flavor to their 'holiday' blend coffee this is not it. But it is a really good, nice, smooth coffee! I am enjoying my second cup right now. I can easily envision it being served at a holiday party or open house - it would pair lovely with any dessert or on it's own. It's also great as a morning coffee. I absolutely give it a thumbs up - but not necessarily for the 'holidays' - but for 'any' day. This morning I came to Coffee Talking with the phrase "coffee around the world" in my head. It was typing this phrase into my search box that led me to a book about coffee; Uncommon Grounds: The History of Coffee and How It Transformed Our World. Putumayo World Music was established in 1993 to introduce people to the music of the world's cultures. The label grew out of Putumayo clothing company, founded by Dan Storper in 1975 and sold in 1997. Co-founder Michael Kraus joined Dan to launch Putumayo World Music and establish a non-traditional sales division. Putumayo World Music has become known primarily for its upbeat and melodic compilations of great international music characterized by the company's motto: "guaranteed to make you feel good!" UPDATE FOR 2017 - Originally published in 2012, the 'holiday bundle package' is no longer available. However I did find the Keurig 2700 Keurig Vue V700 Single serve coffee system was still available without the "package deal" gift basket originally posted in Fall 2012. You can still get the coffee brewer.